Granite Pond is my mind's image of a typical scene near my White Mountain home and, I hope, conveys some of the beauty of this New Hampshire landscape. 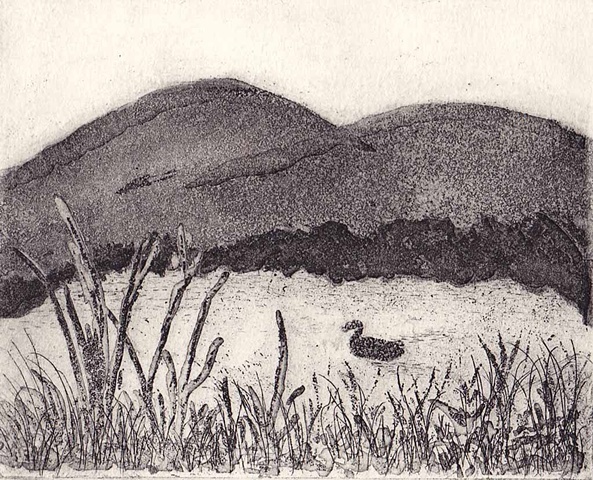 The copper plate from which this print was made with a series of line etchings and aquatint. I began preparing the plate using a "coffee lift" ground at a March workshop at Zea Mays Printmaking Studio with Anita Hunt in March of 2011. Edition of 20.